Medina Electric Cooperative Director Hugo Villarreal and his staff worked diligently to assist The Rio Grande City CISD Technology Department in reconnecting technology cables that were damaged during a recent fire at Ringgold Middle School. The students were able to use the computers and internet services very soon after the fire. The Technology Department and the RGCCISD administration and staff would like to thank Medina Electric Cooperative for their support of the district’s students. 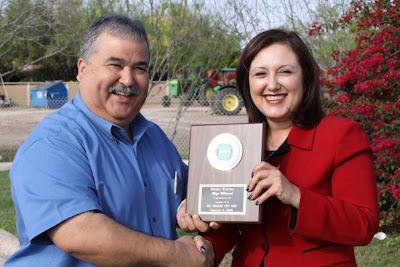 Pictured above are Ms. Vilma Garza-Technology Director and Mr. Hugo Villarreal-Medina Electric Cooperative, Inc. Director. (RGCCISD photo).